Agreeable hack-n-slash fare the puzzling and platforming is lightweight, but offsets the roaming and robust combat well. Now I am become Death, the destroyer of worlds. Also: pusher of buttons, fetcher of quest items and avid parkour enthusiast. I'm also a dab skeletal hand when it comes to rolling giant glowing weighted balls into the sockets of improbably elaborate stone machinery. You'd think all that reaping would keep Death busy on its own, but according to Vigil's lite-RPG adventure, you don't know the half of it. Death finds himself in a green and pleasant fantasy land in search of the Tree of Life. There he hopes to find absolution for his brother, War, who apparently prematurely annihilated mankind during the course of the preceding game. But this realm, the Forge Lands, has its own problems – gloopy problems by the name of Corruption, which seeks to wrap its black, slimy tendrils around the very forge of life itself. So it is that Death finds himself distracted from his primary goal by a series of dungeon crawls to aid the people of the Forge Lands, combining a mixture of platforming challenges with minor puzzling and a healthy dash of hack-'n'-slash. Comparisons to the Legend of Zelda games are warranted – and welcome – given the way the sprawling overworld hub tapers off into dungeony spokes, full of flipswitches and pressure plate puzzles. Well, I say puzzles, but for the first ten hours of the game it mostly seems to be the same puzzle, to which the solution is: roll a glowing ball into a glowing socket. Sometimes you have to roll a ball into another socket first, in order to access the second ball. Sometimes you have to find some explosives to blow up an obstacle. Sometimes you have to roll a ball onto a lift, ride it up, then throw it onto another from your newly elevated position. This is not cryptic stuff. I have been more puzzled by food packaging. Later, you gain access to much more elaborate powers, such as the ability to create lurid green and purple clones of yourself – all the better for pushing buttons with – and the ability to open portals, but the level of challenge rarely soars above 'gently pondersome'. That said, the pondering is not unpleasant. It's not about austere brain-searing perplexity so much as spending a little time in environments that feel pleasingly tactile and open to exploration. It's just the right-sized mouthful before the platforming or combat starts again, and if any one of the game's several parts is slightly undercooked, at least the quantity of the serving is exactly balanced. As for what else you get on your plate: along with that dollop of Zelda, there's a lukewarm ladleful of Prince of Persia. Environments are etched with traversal routes – scuffed walls indicating you can run along them, while distinctive crevices offer handholds. Later a spectral grapple power enables you to swing from hooks embedded in the ceiling. The movement between all these points has a pleasing rhythm to it but is rarely taxing. It's not until you journey beyond the Forge Lands that issues of timing raise their head. There you find yourself leaping between platforms which sway beneath a dirigible hauled by a pair of giant serpents. This makes a rare and spectacular change from the familiar sequence of grapple points and wall traversals, but is quickly gone. Mostly, platforming challenges are nakedly prescriptive: Death's acrobatics don't give him freeform access to an environment; rather, if you see a ledge, you are meant to go there. It may be that the game sacrifices some of the wonder of its world for legibility, but the opposite is often true as well: chesthigh platforms that seem well within Death's capability to clamber over will not oblige unless you use the prescribed handholds. The low challenge of this rhythmic dance between obstacles feels like it is designed to contrast with the sweaty palms of combat. This is much improved from the button-mashing of the previous game, now taking its cues from Japanese-style brawlers like the consoles' Bayonetta. You must more thoughtfully intertwine combos and dodges, building up meters and then spending them on a series of upgradeable special powers. It's gratifyingly tough: enemies attack in groups, and often simultaneously, forcing you to dodge in and out of combos, or lay down floor-clearing area-of-effect attacks before singling out opponents. You might assume Death would be quite the natural at this whole killing thing, but his skillset is initially limited, constraining the player to basic mashing and constant, panicky evasion for the first few hours. But as your moveset increases you can take the offensive in a much more considered way, equipping talismans, armour or weaponry that lets you vampirically absorb health with every blow or knock enemies over. Attacks fill up two different power meters. The lesser of these is Wrath, which can also be topped up with potions, and grants you access to a number of powers unlocked with skill points as you level up. These are powerful dash moves and roomclearing melee sweeps in which you manifest as a giant winged Grim Reaper. Alternatively you can invest in summoning powers, bringing ghouls and crows to fight at your side. The second meter measures Reaper power, which builds up slowly as you deliver blows and eventually enables you to assume Death's 'true form' for a good number of seconds – worth saving for the most dire circumstances. Such circumstances might easily be any one of the apocalyptically irritating boss battles. They are tricky customers, partly by design, partly by failure of design. Clipping issues occasionally deflate your efforts. A later boss enemy floats just off-screen above you. This is infuriating because you haven't learnt any aerial combos with which to dispatch him, and all the more so because it feels like you're trying to swat a fly inside your own head. Oh, and he can turn invulnerable. Oh, and he can resurrect other foes. Who thought this was a good idea? I ask only because I feel I should apologise to their mother for all the terrible things I said. I'm sure she's a fine woman. 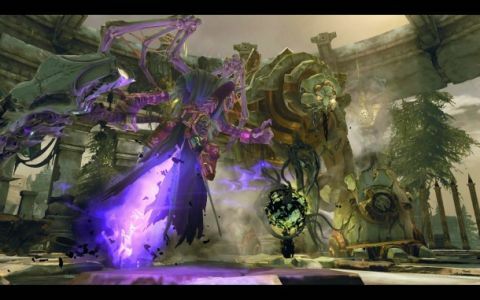 Boss battles and other combat difficulty spikes aside, Darksiders II offers a rewardingly deep system of combos that must be exploited with intelligence and precision. It's this that makes the lack of challenge in platforming or puzzling an amiable respite rather than a bore. In fact, the sum of the game's parts makes for a pleasingly Zen experience, as you tool back and forth across the world, summoning your ghostly horse with a tap of a button, swiping creatures off their feet as you gallop past. Aesthetically, it's a little conservative – nailing the sort of themes that teenage boys enjoy before they've lived long enough to encounter the notion of cliché. But if the broad brushstrokes are banal, the detail is extremely accomplished, drawing its caricatures with enough idiosyncratic flare to be memorable, and breathing drama into what might otherwise have been check-box landscapes. The voicework is a pleasant surprise too: as Death, Michael Wincott's deep sardonic rasp channels the sound of a thousand whiskey hangovers, in a script that is enthusiastically hammy but not cringingly corny or crass. Jesper Kyd's score is a winsomely eclectic mix, sweeping between far-flung musical and mystical traditions, matching wispy Celtic vocals with strident pentatonic chimes, murky synths and shades of Mongolian throat-singing, and somehow delivering pulsing, moreish hooks without their repetition ever grating. From a technical perspective, Darksiders II doesn't step up its efforts to match the capabilities of the PC. The art style ensures it's a relatively handsome game in spite of its occasional bleary textures and lacklustre graphics options, but this is a hasty port, only just maintaining a cruising altitude of 'mostly operable'. Changing resolution causes major spasms, leaving some menus in the wrong shape, while standards such as hotswapping between keyboard and gamepad are still absent. And though given its DNA this is clearly designed with a gamepad in mind, even those controls seem to be a little unreliable, as context sensitive commands sometimes fail to register. Should a patch or two put these teething troubles behind it, then Darksiders II will provide a pleasant amble. Its platforming and puzzling may be undemanding, but in balance to its respectably rich combat challenge, they make for as relaxing a journey as you might expect in the company of Death.